How can I push URLs from Android to AirDroid Web? I was able to push URLs from my phone to the desktop client, but I deleted the desktop program because there were too many bugs. When I want to share a URL from my mobile browser (Chrome) I still get the option to push it to the desktop (even though it's not there anymore), but not the Web client, even though they are connected at that moment. 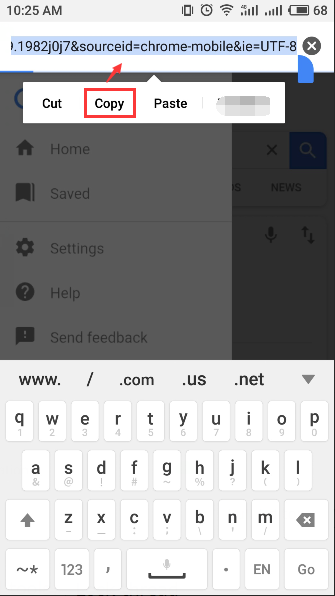 Re: How can I push URLs from Android to AirDroid Web? AirDroid is not working upon updating my Google Pixel 2 XL to Android 8.1. The app crashes right on startup. Any help? Not sure, but you should try creating your own post for your question; you're not likely to get a lot of answers when you've posted your problem as a reply to my own! We're sorry that you can't send the file or other to web directly like to desktop AirDroid. But you can use clipboard on web AirDroid to push URLs from my phone to computer. 1.Copy the URLs in your phone. 2.Then sign in to web AirDroid > Click Clipboard > Click refresh button, and the URLs will paste in the windows. And would you please tell us what do you think of desktop bugs? Could you tell us the detail of the bug so we can fix it? I would love something closer to the regular push feature to be able to come back to it when I want instead of keeping it in my clipboard, but this will do well! Thank you. When running, I would often get weird phantom-like program borders on my desktop (which weren't the same dimensions as the program), and would only go away if I exited the program. I am running the most recent build of Windows 10 on a Lenovo Yoga Series 13. Would you please click this link to download the AirDroid and then to open to see if it works? Thanks for your prompt reply. We'll fix it as soon as possible. Android is an open source stage for cell phones. It is produced by Google and is introduced on more than 1 billion gadgets. It is as of now the universes most mainstream versatile working framework. I want that push feature back!